This book begins with a brief account of the extraordinary sequence of events that led to emergence of grasslands as major vegetation formations that now occupy some of the driest and hottest and the highest and coldest on earth as well as vast steppes and prairies in more temperate climes. It is the story of grasses successfully competing with forests and woodlands, aided and abetted by grazing herbivores and by humans and their use of fire as a tool. It is a story of adaptation to changing climates and the changing biophysical environments. A major focus of the book is the Palaearctic biogeographic realm that extends over some 45 million km(2) and thus more than 1/3 of the terrestrial ice-free surface on Earth. It comprises extensive grasslands of different types and origin, which can be subdivided into (1) natural grasslands with (1a) steppes (climatogenic in dry climates), (1b) arctic-alpine grasslands (climatogenic in cold climates) and (1c) azonal and extrazonal grasslands (pedogenic and topogenic) as well as (2) secondary grasslands created and sustained by human activities, such as livestock grazing, mowing or burning. Grasslands of the Palaearctic do not only form a major basis for the agriculture of the region and thus its food supply, but are also crucial for other ecosystem services and host a supra proportional part of the realm's plant and animal diversity. To reflect that suitability of grasslands for biodiversity strongly depends on their state, we apply the term High Nature Value grassland to those natural grasslands that are not degraded (in good state) and those secondary grasslands that are not intensified (semi-natural). The situation in a variety of countries where grasslands are evolving under the influence of global climate change is also considered. Case studies are presented on Southern Africa, Eastern Africa, India, China, South America, North America and Australia. The concluding chapter examines a set of themes arising from the chapters that make up the bulk of this book. 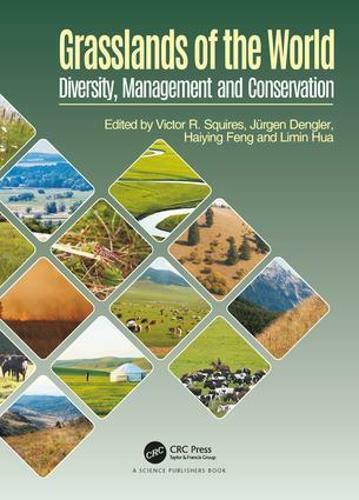 The following provide a focus: recent history of grassland biomes - brief recap of current thinking and recent trends with special reference to dry grasslands in the Palearctic regions; the current status of grasslands and germplasm resources (biodiversity) - an overview; management systems that ensure sustainability; how to recover degraded grasslands; socio-economic issues and considerations in grassland management; the impacts of environmental problems in grasslands such as future climate change and intensification and the problems/prospects facing pastoralists and other grassland-based livestock producers.